Hummingbirds are fascinating, but how much do you really know about these flying jewels? How many types of hummingbirds are there? There are more than 300 species of hummingbirds, but there are only about a dozen species that regularly visit the United States. Only one, the ruby-throated hummingbird, spends the summers east of the Mississippi River. The greatest diversity of hummingbirds is found in Central America and South America, where dozens of species may be seen all year. Hummingbirds are only found in the Americas, and depending on the species, they may be seen as far north as Canada and Alaska and as far south as Argentina and Chile. Hummingbirds can be found in all types of habitats, from thick forests to open meadows to tropical rainforests to the arid edges of deserts. Hummingbirds are some of the very smallest birds, and the smallest bird in the world is the bee hummingbird that measures just 2.25 inches long. The largest hummingbird is the giant hummingbird, found in the Andes Mountains of South America, and it is 8-9 inches long. Most hummingbirds in North America are 3-5 inches long. Hummingbirds are best known for consuming flower nectar, which makes up most of their diet. They also eat many insects and spiders, which gives them plenty of protein, especially for young hummingbirds that need good nutrition to grow. Some hummingbirds also eat flower pollen or sip sap from trees. Can I make nectar to fill hummingbird feeders? It is easy to make homemade hummingbird nectar. Mix one cup of water with one-quarter cup of plain white table sugar, and stir until the sugar is completely dissolved. It may be easier to use warm water or boil the water to be sure all the sugar is dissolved. It isn't necessary to add any red dye to the water, and extra sugar water can be stored in the refrigerator for a week or two before it is used. 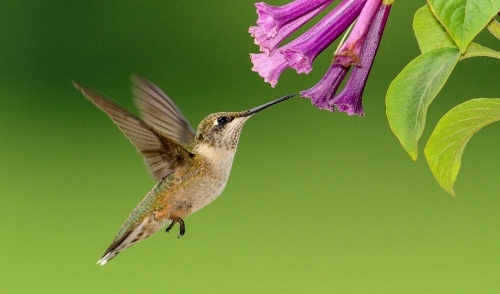 What flowers do hummingbirds like best? Hummingbirds visit all types of flowers, but their thin bills are specially adapted to feed on long, tubular flowers. Red, orange and pink flowers are especially attractive. The top hummingbird flowers include butterfly bush, bee balm, trumpet vines, cardinal flowers, salvia and columbine. Hummingbirds get all the liquid they need from the nectar they feed on, but they still visit small fountains for baths. The fountain must be very shallow for hummingbirds to feel safe, and they may also fly through sprinklers or misters to get wet. Hummingbirds have even been seen rubbing against the dew on leaves to take a bath. A hummingbird may not seem like a big mouthful, but there are many predators that will happily have a hummingbird for a snack. Praying mantises may stalk hummingbird feeders and impale unsuspecting birds, and other predators such as cats will also hunt hummingbirds. If a hummingbird flies too low over water, a large fish could catch it, and some other birds will eat hummingbirds, such as roadrunners, shrikes and kestrels. Their wings may be tiny, but hummingbirds can be big migrators – the rufous hummingbird migrates from northern Alaska to southern Mexico. Hummingbirds usually time their migration journey to coincide with abundant blooming flowers so they can refuel along the way, and before they start traveling, they may gain extra weight for fat stores that will also provide fuel. Why are hummingbirds' throats so colorful? Many male hummingbirds have very bright throats, called gorgets, but the feathers aren't really colored. It is the intricate, microscopic structure of the feathers that catches the light and reflects bright, metallic colors, which is why their throats can also appear black if the light isn't very bright. Female hummingbirds usually have plainer throats or just a few spots. Want to learn more about hummingbirds? Put out a hummingbird feeder and see what you can learn from these amazing backyard guests!